ECDPM is a leading independent think tank that wants to make policies in Europe and Africa work for inclusive and sustainable development. ECDPM focuses primarily on EU foreign policy and European and African policies related to conflict, migration, governance, food security, regional integration, business, finance and trade. With G Suite and the Google Cloud Platform ECDPM creates a more effective way of collaborating within the organization when drafting policy recommendations. They work for governments and several key target audiences in Europe and developing countries in Africa, the Caribbean and countries in the Pacific. For a number of years, Google technology is used for the internal organization; making communicating and collaborating much more efficient and more effective. Their young team rapidly adopted this technology, and new developments for new applications are in abundance. The Foundation ECDPM (European Centre for Development Policy Management) was founded in 1986, aimed at contributing to effective development, analysis and implementation. As independent intermediary ECDPM operates between the regions of Africa, the Pacific and the Caribbean in connection with Europe. As a true knowledge organization ECDPM has a strong reputation as a non-partisan, strategic "think and do tank." With offices in Maastricht and Brussels, the organization has 70 employees, over 20 nationalities and a young team collaborate to achieve their goals. Lemmens states, "When you are looking to change something you have to look at yourself as well. To make policy work elsewhere (for example Africa), you must look in the mirror (in Europe) and accept to change certain things if necessary. Far-reaching globalization shows, more than ever, we are interdependent and international relations and collaboration are of great importance. One is strongly connected to the other and so is our way of working. Late 2011, we attended a conference where we first learned about Google technology. At that time we busy overhauling our own software; many different technologies, which all required maintenance. That was inefficient. We requested Logica CMG to do research for us and described the efficiency benefits when changing our IT systems. At that time, we were already in contact with Qlouder and together we created the path towards a cloud environment." "We have offices in Maastricht and Brussels and our employees travel frequently. Thus making communication and collaboration very important. Google automatically comes to mind. We work in a project structure with working groups. Collaboration is essential for us, also within documents. Qlouder recognized our needs and wishes and together we started this journey. 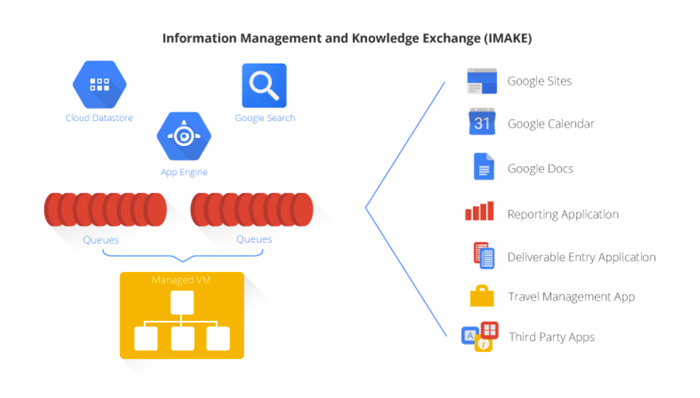 We established the project group IMAKE (Information Management and Knowledge Exchange), our Knowledge Management Manager is the project leader. I was also part of the project team. It is a very interesting project that influences all levels of the organization." ECDPM started with Google Mail, Calendar, Chat, Hangouts. Then Google Docs, Sheets and Drive and finally Sites. Stefan Hogendoorn (Chief Geek at Qlouder and primarily involved in this project, ed.) notes, "For ECDPM we developed a process supporting system that enables employees to easily capture and use information about their activities." Lemmens: "An employee that, for example, is working on a project writes several documents/reports or chairs or participates in a conference. We call these 'deliverables.' When returning from a trip, an employee files a Back to Office report, containing information about people they have met with. Also, the results of work will be reported. All this information is entered in IMAKE and part of our knowledge management environment. Monitoring and evaluating our work is of great importance. IMAKE is an important foundation that enables us to do our job." "We want to anticipate on developments within our sector. The evaluations and strategic thinking we do in our work, also applies to our own thinking and learning process. The moment something becomes standard, we withdraw. That is why we believe in the transfer of information and knowledge." "In the past everyone had their own documents on a hard drive, employees now work together in teams on documents. Writing documents is an important part of our core business. We first conduct studies, write an analysis and tune its results and communicate about this with various parties. We then transform this into a publication that policymakers can use. Both in the research phase as in writing a hypothesis or analysis you can easily collaborate in a project in a Google document. We work with young teams and these people get a hold of the new way of working quickly. They are often familiar using Google in their personal lives." "We supported our employees as well. We worked together with Lian Katsman from Cloud College (partner of Qlouder, ed.). She trained the first users. This group of key users consisted of people from different cultures and ways of thinking and thus formed a reflection of our entire organization. After the training this group took care of further knowledge transfer within the organization. The communications team, a young, enthusiastic group of people with very clear ideas, supports this. We share information via an internal newsletter, we organize internal seminars and on a large planning board we show where we stand with IMAKE and which steps will follow." "The platform is ready, yet we constantly have new insights. We want to update the user interface to a modern design to further increase the usage. We also establish a new unit "Knowledge management and internal learning," of which IMAKE will be a part. We critically review the current situation and make an inventory what could be improved. Together with Qlouder we examine the possibilities to create a cloud-based CRM system. We want to avoid the fragmentation of all kinds of different systems and create interlinks instead. We have a lot of information in our project sites. We want to be able to distract this information quickly, for example for tender purposes. Qlouder can build this for us using add-ons. Working with Google Cloud technology keeps ECDPM flexible. Google is constantly innovating and changing its tools regularly. That keeps us focused and ensures we constantly think about how we can organize our work in the smartest way possible." "Working with Qlouder is very pleasant, it is always sparkling, innovative and stimulating. I think of Qlouder as a flexible, innovative organization. They always come up with solutions and that is very valuable to us. The past few years we truly worked as partners and together we created something great. For us now it is time to further focus on internal learning, adapt the internal organization and then take our next steps. First policy, then implementation, which perfectly fits our philosophy." "It is interesting to be working on a change that affects all levels of the organization. Our employees travel a lot and communication and collaboration are very important, you almost automatically think of Google."